Well maintained Ranch Style Home on over 2 acres with a Guest Cabin! Arctic Entry, Wood Stove, Lots of Dry Storage in Crawl Space and manicured Lawn too! New DEC Septic installed in 2017. 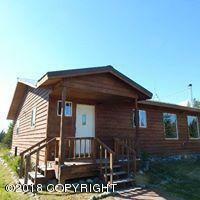 Loft in Cabin completed and all new appliances in 2018 Cabin has Master bdrm, Bath, W/D. Main cabin floor is 480 sq ft not counting the loft. Home has excellent VRBO history too!